When leaves begin to fall, many homeowners' thoughts turn to how to remove them from the yard. The way to go about the cleanup depends on whether you just want to get rid of the leaves or use them to fertilize plants or improve soil drainage. Shredding leaves with a lawn mower and leaving them on the grass to decompose not only clears the lawn but adds nutrients to the yard. When leaves first begin to fall from trees and are dry, rake or blow them onto the lawn from garden beds, sidewalks and other areas. 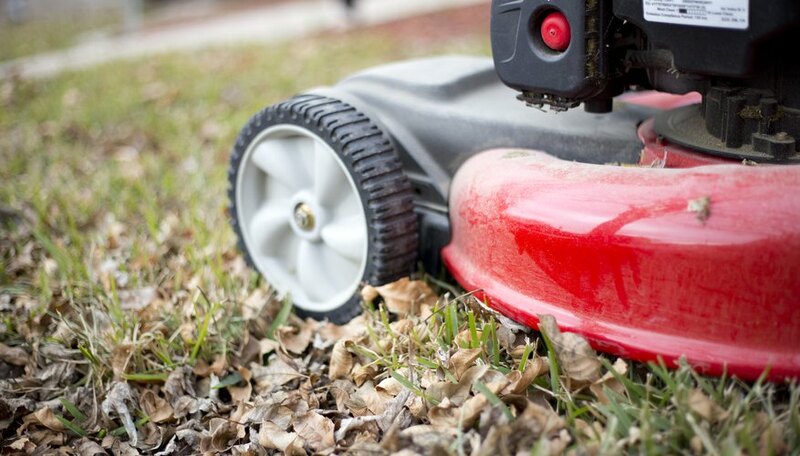 Adjust a lawn mower equipped with mulching blades so its deck is high enough to skim the leaves. The objective is to shred the leaves, not mow the grass. Run the lawn mower over the leaves several times, shredding them and dispersing them across the lawn in a thin layer. Continue mowing the leaves until you can see mostly grass and little leaf litter. This process may take at least four or five passes over the leaves. Repeat the shredding procedure weekly until leaves no longer cover the lawn. 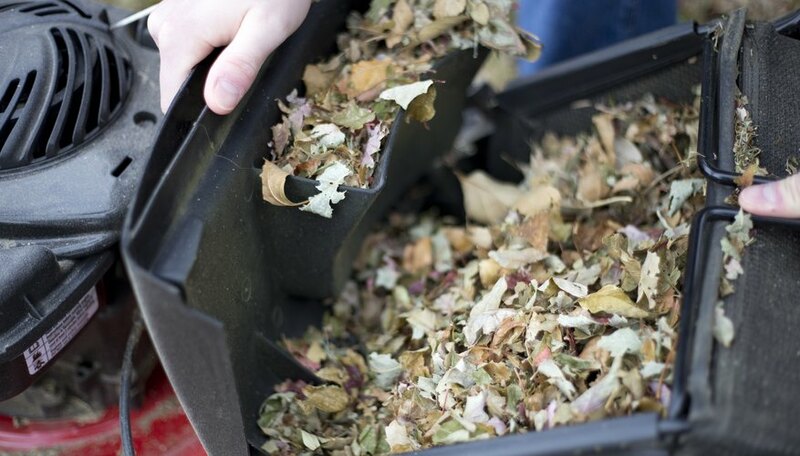 Don’t wait to shred all leaves at one time because they can clog a mower. 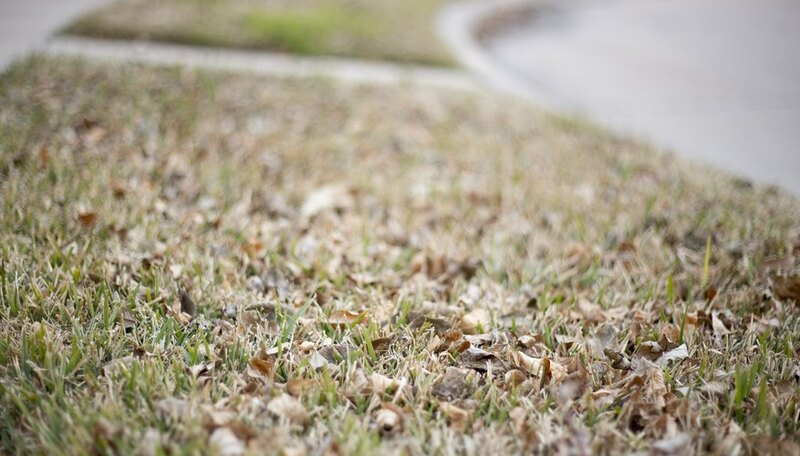 If an area such as a grove of trees has a dense leaf layer, then removing the leaves and spreading them as mulch in garden beds may be necessary to prevent them from killing the grass. If you prefer to rake leaves, you can make the task easier by using a tarp or old bed sheet and a wide rake, and by raking when the weather is calm so the leaves don't blow as you work. Lay the tarp or old bed sheet near where you want to remove leaves, and rake the leaves onto that material. Pull the material's corners upward to create a giant bag, drag the bag to the street curb and dump the leaves there for pickup if your location provides curbside leaf pickup. Otherwise, pile the collected leaves next to a compost pile, and incorporate them into the pile during winter. Using a no-clog rake, wearing gloves to prevent blisters and raking some leaves each week makes fall leaf cleanup easier. 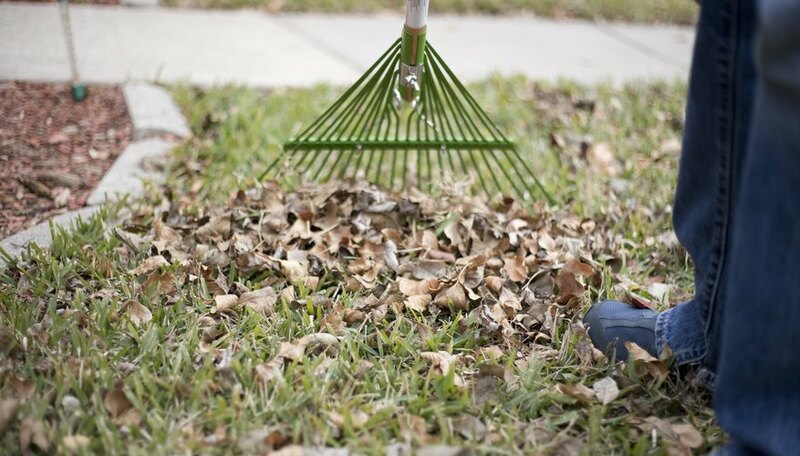 Raking each week means you'll rake the same area multiple times, but the task will be less labor-intensive than if you raked all the fallen leaves at one time. You can make simple work of bagging leaves by using a riding or walk-behind mower equipped with a bagger or discharge collection bag. If you want to use bagged leaves as mulch, then set the mower's deck high enough so the blades do not clip the grass but primarily pull in the leaves. Dump the bagged leaves around plants in your vegetable garden or around ornamental plants, including trees, but don't let the leaves touch any kind of plant. As the leaves break down, they will release nitrogen and other beneficial nutrients into the soil for uptake by plants. Leaves removed from your lawn can be used to improve drainage in clay soil or increase the water-holding capacity of sandy soil by turning them into leaf mold. "Leaf mold can hold up to 500 times its own weight in water," according to an Organic Gardening website article. The process of making leaf mold begins with piling leaves not more than 6 inches high in one area of the lawn then running over them with a lawn mower to shred them. Keep the leaves contained by starting at the pile's outer edge and mowing in a circle, blowing the discharged leaves toward the circle's center. 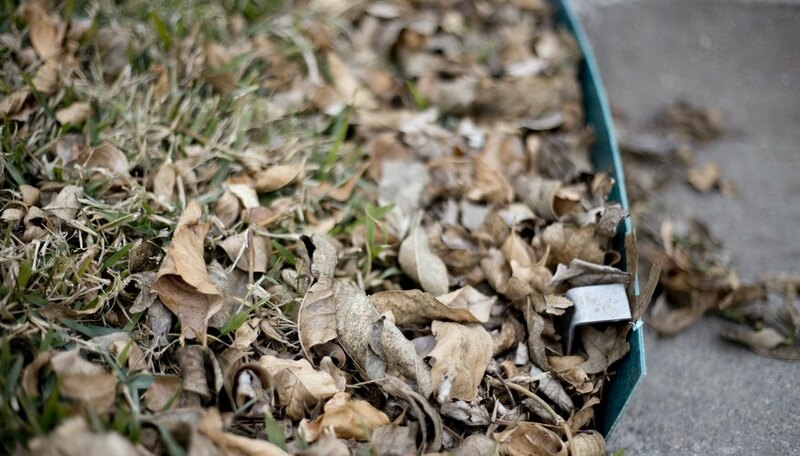 Pile the shredded leaves in a back corner of your yard, and let them decompose to become leaf mold during winter. In spring or early summer, spread a 3-inch-thick layer of the leaf mold on the soil where improvements are needed, and work the leaf mold into the soil's top 5 inches by using a garden rake.